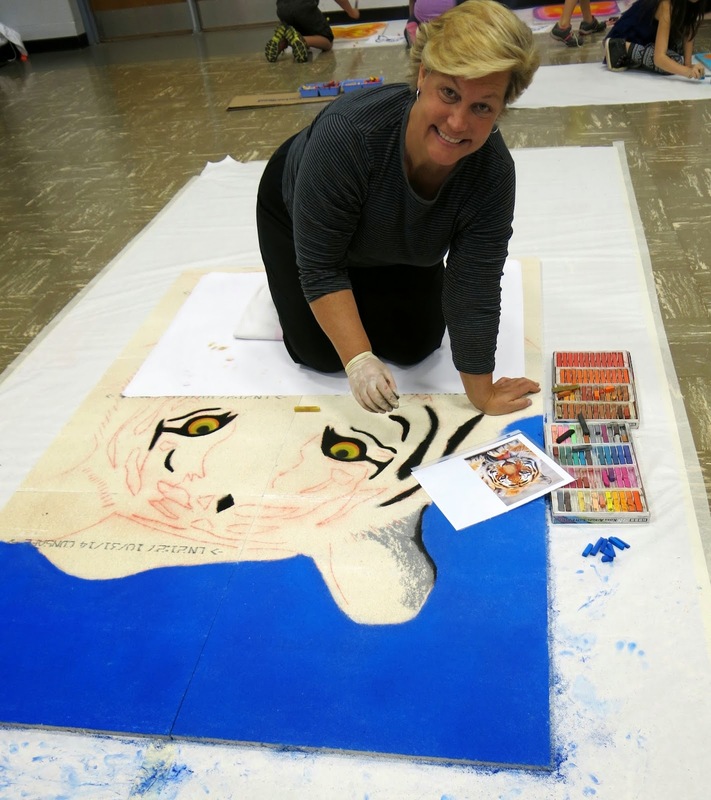 For months I'd planned on having street painter Lee Jones visit my school, chat with my students and have them participate in their very first street painting event. Juz to give you a lil back history on street painting, aka sidewalk chalk art, it surprisingly goes back to sixteenth century Italy. The Madonnaro were homeless artists who created lavish images of the Madonna, their namesake, in front of cathedrals in hopes of earning spare change from passerby. From this, Madonnari, or street painting events, evolved all over Italy. Twenty years ago, street painting made it’s debut right here in the U.S. and it’s been growing into a movement of performance-meets-fine-arts since. In preparation for the happenin', my super amazing bookkeeper (love you, Julie!) helped me track down the best deal on KOSS chalk (great stuff, man. Check it), foam brushes and mountains upon mountains of baby wipes. I'd prepped the kids by introducing them to what they'd be creating (like, der, butterflies) with that intro lesson I shared last week. We were beyond ready to get our street paintin' action on. And then, the forecast: RAIN. Lots of it. With some thunder and lightening thrown in for good measure. Gee, thanks, Muthah Nature. You's the bestest. So, like, whuuuut to dooooo?! Okay, I don't like to brag or anything (hair flip), but every once in a while, I have super good idea. And, by "every once in a while", I mean, this one time. Right here. I decided on the fly that instead of us working outside, we could work inside on a texture that was similar to that of a sidewalk: ceiling tiles. My principal has been asking me all year if I'd have the kids create masterpieces for the ceiling and this seemed like the perfect opportunity. And, I have to tell ya: it worked out great! Added benefit: we now have permanent art on display at our school not temporary street art. So, take that Muthah Nature! I found me a silver lining and I made lemonade from your stinky lemons. * KOSS brand chalk. We also had some Prang and Crayola thrown in for good measure. * Ceiling tiles. Ours are 24" squares. A parent volunteer divided each square with a vertical and horizontal line right thru the middle which allowed the kids to try their hand at the grid method. This is one means by which street painters work. By the way, we used the back of the tiles as the texture was better suited. * Foam brushes for blending. * Cheapo hairspray (that Aqua Net we used in junior high? It's still around and good for sumpin) for setting the chalk. We held the event in our school's multipurpose room. With the help of volunteers, we laid out sheets of bulletin board paper to protect the floors. 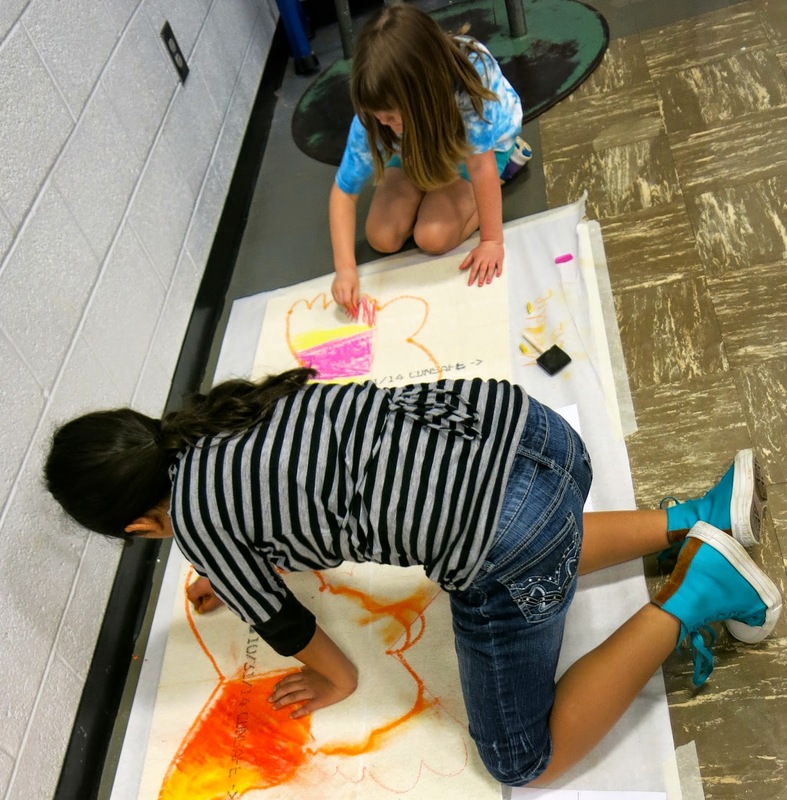 Each kid had their own board, foam brush and light peach chalk to initially sketch their design. In the photo above you can see my teaching set up. I was teaching 80 second grade kids at once which was a total trip. I staggered my teaching so as not to overwhelm them with instruction. 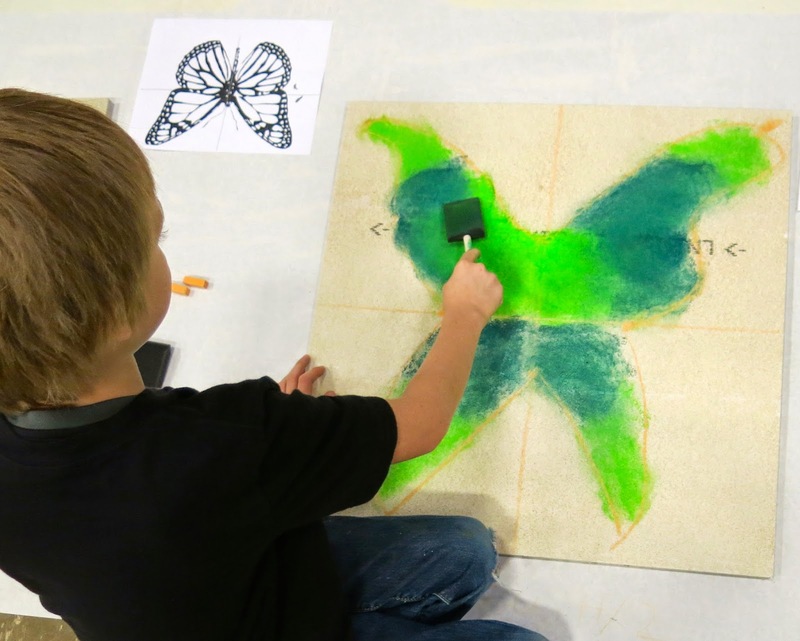 So for the first step, I gave them guided drawing instructions on sketching their butterfly outline. 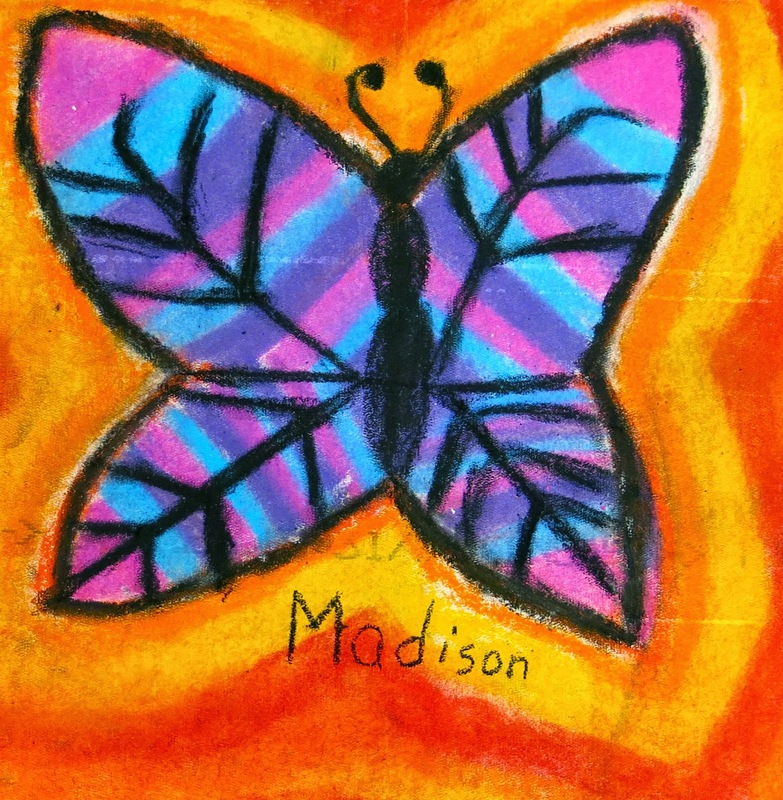 This was a snap for them as they remembered our butterflies from last week. You can see my drawings on the white paper in the photo above. Next up: block in your butterfly. I told the kids that every time they heard me ring a bell, they were to stop, drop and come to the floor for the next set of directions. If they hadn't finished sketching, that was okay, they could resume once I was done speaking. 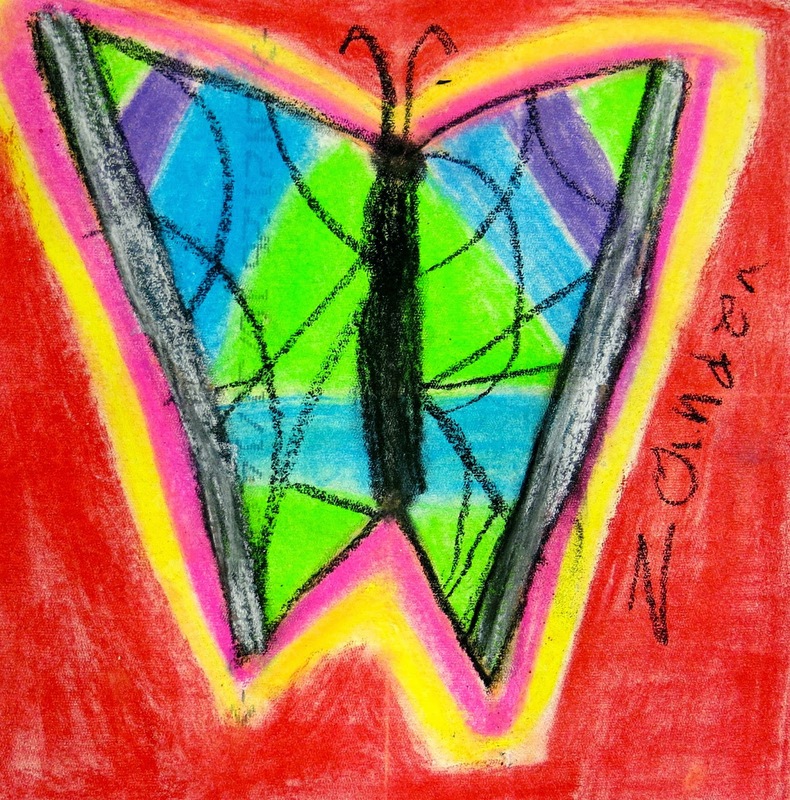 The kids had the choice of using all warm or all cool colors for their butterfly. They blended the colors in small circles so as not to lose the vibrancy of their color. Second grade, y'all. Like, wow. Loving every minute of it! Since we were on the floor it did give the same feeling as street painting. Upon our third on-the-floor chat, we talked about the background. This time they had to use the opposite color family of what the chose earlier. Block it in and blend, kids. By the way, we use the chalk horizontally as that covered the most amount of surface. Lee was working just as hard as the kids right alongside them. That was a wonderful experience for the kids. As they roamed the room gathering their chalk, they would plop down and chat with her or just watch her chalk. The background came together so nicely with the butterflies! At our last chat, we talked about using the black chalk. 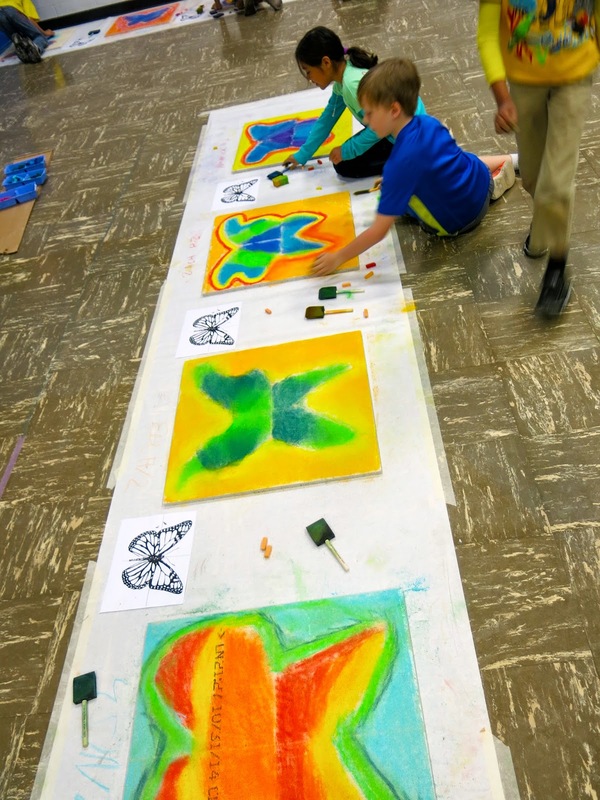 They sketched in the three parts of the butterflies body as well as outlining and any pattern making they wanted to do. Last thing: sign it. Lee told the children that when they signed their work that was it, no going back. I love our school mascot the tiger here! 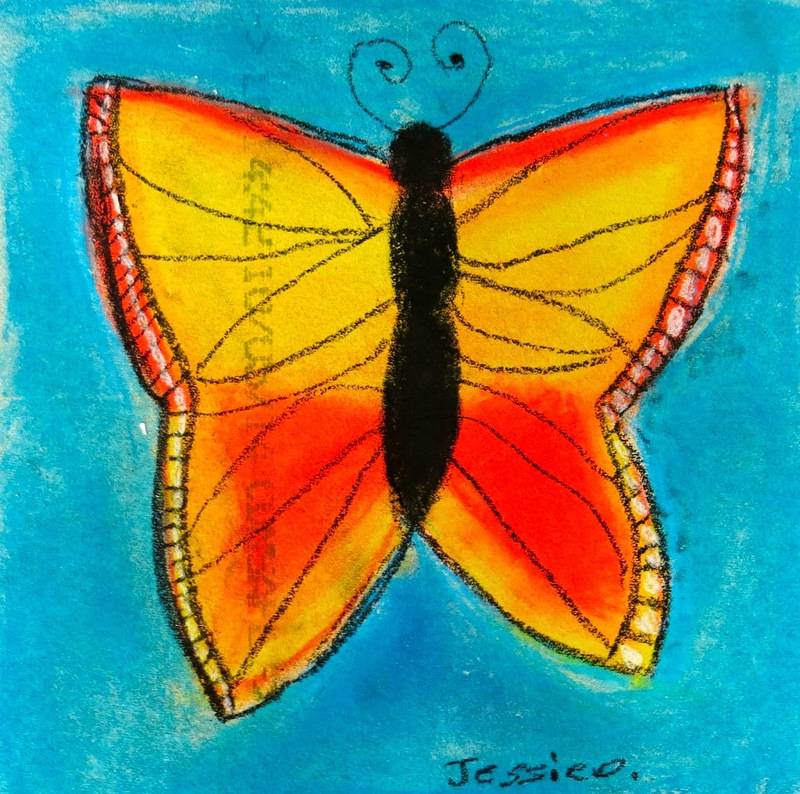 And the beautiful butterflies fluttering down the hall. There were many a folk walking with their head looking upward down the hall today! Now the kids are asking: what ELSE can we make for the ceiling! For now, we'll just stick with these beauties! Simply marvelous! Great work - kudos to your second graders and to you. I think Mother Nature did you a favor...how AWESOME to have some fluttering friends in the hallway! I think so too...I love that we can enjoy these forever! so wonderful! so cool that they were able to work side by side with the visiting artist. nice spacing of the tiles in the hallway too! Thanks, bro! I can't take any credit for the placement of the tiles, that was all my awesome custodian friend! When I was in elementary school, we did one legacy project, which was a literature mural. I still remember going back years later to show my mom the shoe I painted. Yup, I got one shoe that was allllll mine. Haha! You never know how proud an elementary student can be of something someone else might deem insignificant! THESE butterflies are far from little, though! What a cool addition to the art room! These are gorgeous! A few questions: Did you have to get permission from the school before doing this? Is there a reason you chose chalk over paint? Love when things work out differently than you expected… and it's even better! Great solution and artwork. Did you spray them with any fixative? Thank you for the fabulous interview with Heidi! You inspire to trust myself and just create. Soooo is this where we are supposed to leave our e-mail address to be entered in the drawing for the book? shiloh_daughter at symbol yahoo dot com is my e-mail. Thank you again. Great Job performed by you!! i am regular blog reader and see your blog have very informative information. wow.. so amazing art in the tiles.. perfect decor for a childs room..
Did you prime your surface first? 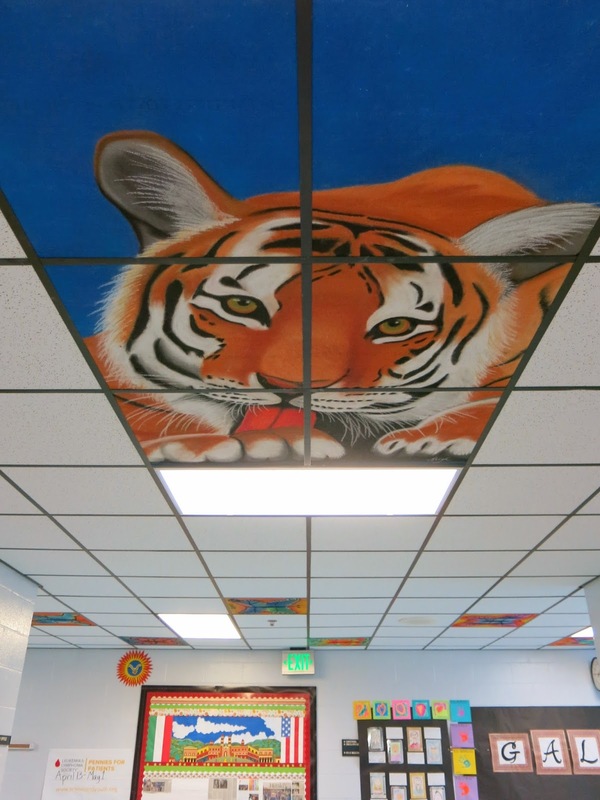 I have done that in the past with ceiling tiles that we painted or or used markers on. This would be waaayyyy easier, not to prime them! No priming! The rough texture takes to the chalk really well. Ours have been up for three years and never had any issue! Out of curiousity, approximately how many pieces did each student use, and did they use the entirety of the piece? I'm thinking about proposing a similar idea for our school and trying to estimate the cost. Hey Liz! I'm unclear about your question. 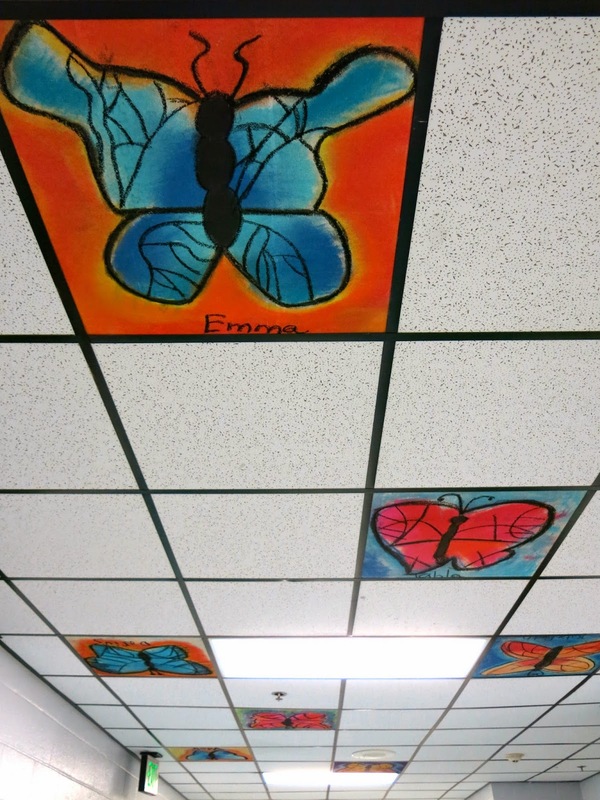 When you ask how many pieces did each student use, are you referring to the ceiling tile? Or the chalk? 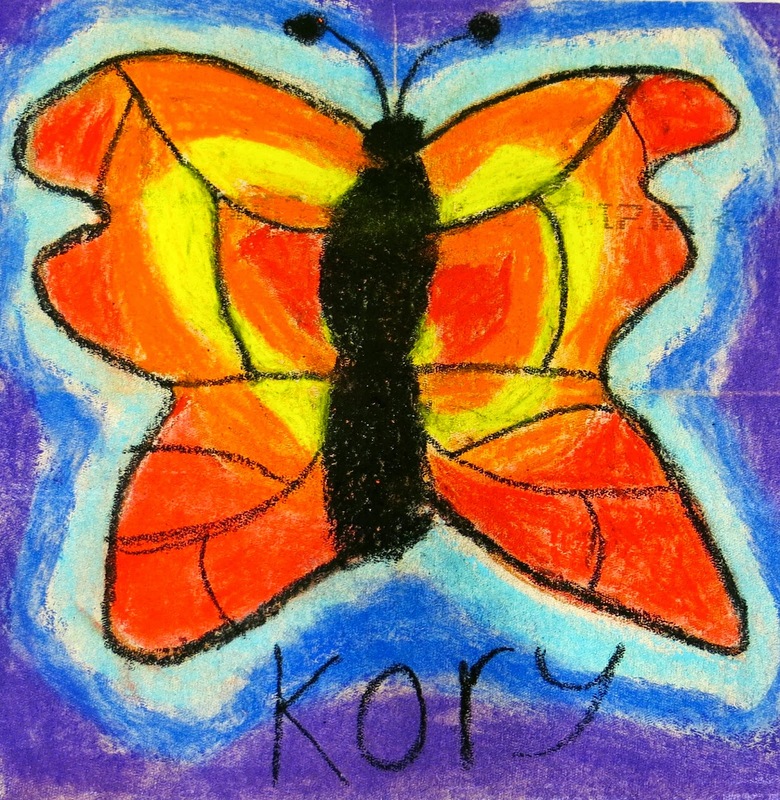 Each student had their own ceiling tile...and we purchase many boxes of chalk but the great thing about good chalk like Koss brand is that it will last. I hope that makes sense and answers your question! 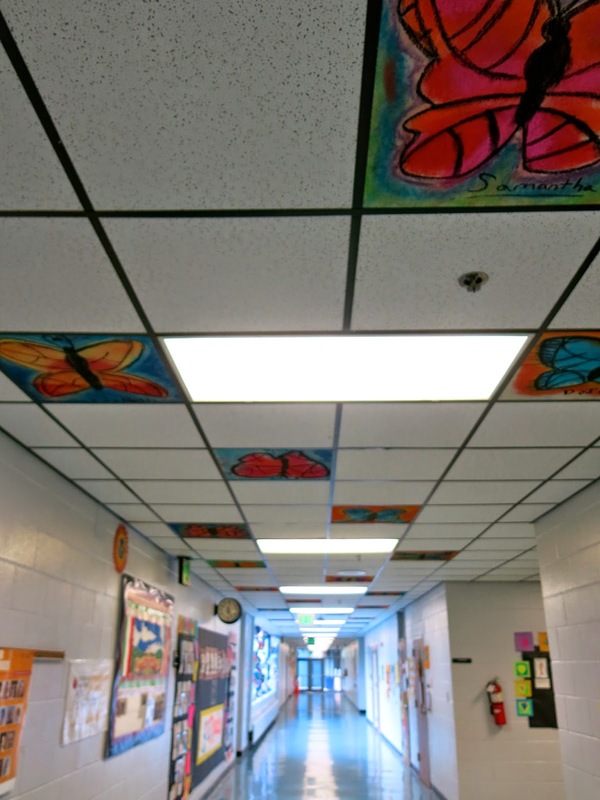 I have been trying to figure out what type of paint to use for ceiling tiles and I came across this blog post - I love the idea of chalk even more! It allows for background color more easily, and blending, etc. What were the baby wipes for? hands? blending? Did they sign their work in chalk too or did you use a sharpie or something for that?